What is Sun is Life Training? Who should take Sun is Life Training? How do I take Sun is Life Training? See what others have to say about Sun is Life Training and Certification. 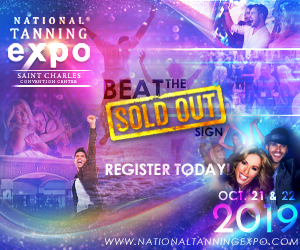 You’ve found the indoor tanning industry’s premier salon operator training program – created by tanning professionals for tanning professionals. Effective: Designed with today’s busy tanning professional in mind, Sun is Life is the cutting-edge, high-impact salon staff training program you’ve been looking for. Innovative: Integrating proven industry Best Practices in salon operation with Guest Experience Principles, Sun is Life teaches learners to consistently deliver exceptional guest experiences. Flexible: The variety of 15-minute modules lets you focus on the Sun is Life Training that’s right for you, right now. Affordable: An investment in Sun is Life Training is an outstanding value! Powerful: Valuable reporting options and back-office tools give management ongoing visibility into staff training progress and results. What makes Sun is Life Training so unique and effective? Proven Salon Operator Best Practices: Sun is Life Training is backed by more than 20 years of tanning salon business Best Practices. Every module teaches professional salon operation, delivered in proven, real-world lessons. Guest Experience Training: Savvy salon operators know it takes more than good customer service to compete in today’s marketplace. Only Sun is Life training teaches specific techniques to go beyond customer service and create engaging, memorable salon experiences for every guest … every time. Downloadable Course Packs: Every Sun is Life Training module includes a downloadable Course Pack containing lesson summaries, exercises and additional resources. Engaging Storylines: The Sun is Life Training method revolves around a storyline that brings the lessons to life. The course follows a fun and familiar cast of characters that includes both salon guests and staff to make each lesson relevant, effective and memorable. Flights: The Sun is Life approach to training is modular, so you can take the training that’s right for you, right now. The program is available in Flights – bundles of modules organized to match staff experience levels with appropriate lessons. Rich Multimedia & Interactivity: Sun is Life is geared toward today’s tech-savvy learner. Lessons contain an engaging combination of rich multimedia, interactive click-maps, music, graphics and animations that capture and keep attention to maximize learning. Enrollment is fast and easy! Sun is Life Training is available online to Tanning Salon Professionals, right here at sunislifetraining.com … on your time, anytime! It’s EASY to begin your very own Sun is Life Learning Plan! The modular format puts YOU in control with the flexibility to choose the training that’s right for you and your team. Enroll in all of the courses now, start with one of the three custom levels, or take each course individually. Choose your entry point, get started, and be on your way to earning your Guest Experience Medallion (GEM) in no time! Click here to review the 25 modules and choose your Learning Plan! 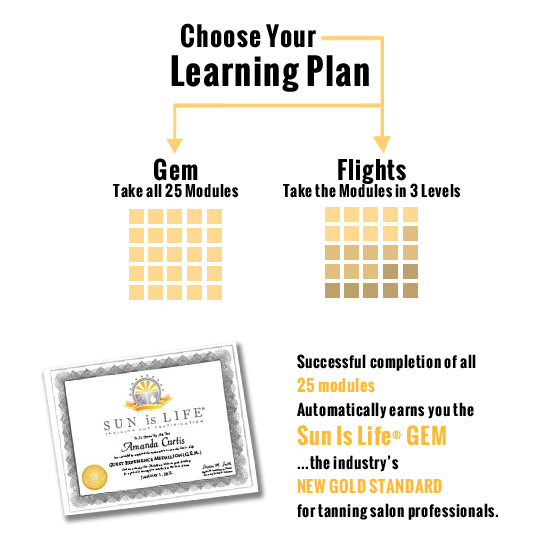 Sun is Life Training and Certification is the indoor tanning industry’s Premier Training Program – unlike any other training program available! Designed with today’s salon staff in mind, Sun is Life consists of easy-to-follow, online courses offered in brief, 15-minute modules. The detailed and in-depth lessons feature engaging multimedia, music and interactive click-maps that keep you intrigued and motivated. This training will instantly elevate your salon’s level of professionalism and teach you how to consistently deliver a memorable Salon Guest Experience.